Ordering coffee in Italy can be pretty intimidating. Sure, you've got your espressos and cappuccinos covered but how about the dozens of other Italian coffee drinks you're missing out on? Thankfully, here's some help. 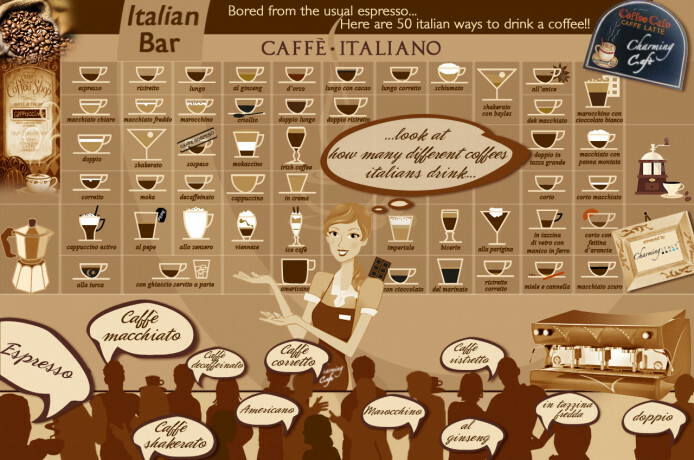 This nifty infographic from Visually covers 50 different ways to order coffee in Italy. You'll find gems like caffè corretto (which translates to 'corrected' coffee, as in there's booze added) and a bicerin, which is a lovely combo of coffee, hot chocolate and fresh whipped cream. Other Italian coffee drinks worth checking out are the marocchino (a blend of espresso and milk froth sprinkled with cocoa powder), caffè al ginseng and caffè shakerato, which is iced Italian coffee that is shaken and served in a lovely cocktail glass. Check out the complete list of 50 ways to order coffee in Italy. Study it well so you can pat yourself on the back next time you visit the Old Country. For an enlarged version of the graphic, just click on the image.